March 12, 2015--Just had this framed at Michael's Arts & Crafts and am very, very pleased with the results. Also saved lots of money. The way this large piece (15.75" x 15.75") is framed (black mat, gold insert, white mat, extra fancy frame), it would have cost me a lot more than the $121 that I paid (after coupons). Happy indeed. December 31, 2014--Here is my last completion for 2014. Love these little pandas and think they'll look adorable in my home office on a bookshelf. Envisioning a black lacquer frame, or maybe inserting this piece into a box top. I must admit, even though I'm not used to painted canvases and chose the stitches myself, am very pleased with the background stitch called "Little Wavy Stitch" found in my iStitches v3 app. The use of the brick stitch for the white fur--well I'm not so sure about that. In the original post about this canvas (below), I wrote about how it was purchased for my DGD. Well as things go, she has gotten involved in many other activities and lost interest in needlepoint, so I stitched it myself. Hopefully she'll pick up a needle again some day and when she does, I'll be glad to help her. PS: There is no designer's name on the canvas except for the number G-674. Does anyone know what that means? August 10, 2013--Visiting family in Ohio and at the recommendation of another ANG Yahoo Group List member, my DGD and I spent a delightful hour or so at A Stitch Above Needlepoint in Madeira (Cincinnati). 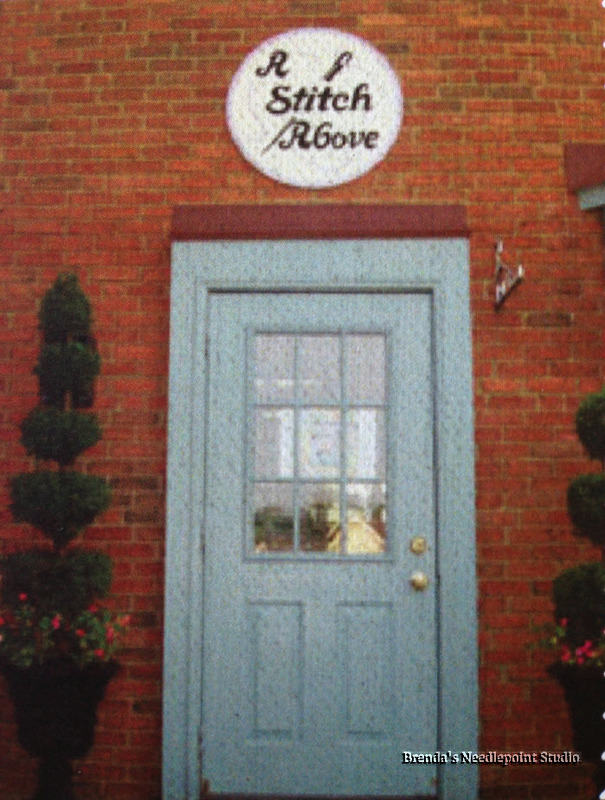 We were given wonderful assistance by the proprietor to find something suitable for a beginning stitcher. Then she helped me decide on which colorway to chose for an upcoming project by pulling threads for both colorways and letting me decide which one I preferred. She is an angel! 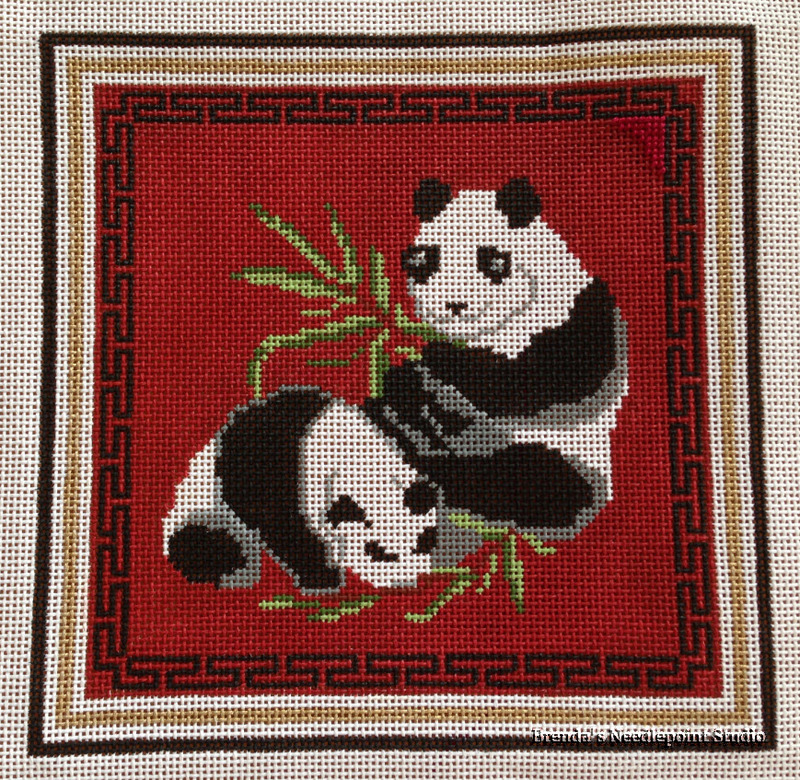 DGD settled on a wonderful painted canvas panda with only 7 colors and using perle cotton (no laying tool required). Hope we have lots of stitching time tomorrow to cover some details on how to properly execute the basketweave stitch. She understands the diagonal direction the stitch takes and recognizes when she makes an error, but hasn't yet grasped the zig-zag pattern flow of moving from one "row" to another. Until then, playdates come first and she's off being an 8 year old girl and all the fun that entails. Thanks Melita. I tried Googling g674 panda canvas and it came right up. Now this blog has the canvas background.